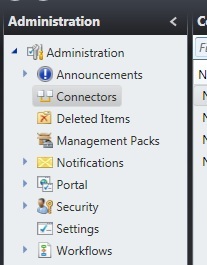 A question was asked by Peter the other day on the TechNet Gallery regarding importing data into the Asset Management Solution that I uploaded. It’s very easy to do, and hopefully this post will explain how for those that don’t know. 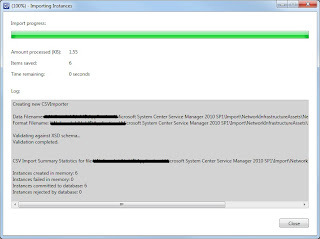 Imports can be performed using the “Import from CSV file…” task found in the console under Administration>Connectors. To be able to import you need two files. For this example I’ll use the Network Infrastructure class as that was the one Peter asked about, but same procedure applies to any Service Manager class. Let’s start with the CSV. You could build the CSV file using the friendly display names of the equipment, but I prefer to use the enum values as this cuts down on the amount of false errors shown during import. N.B. If you’re adding your own equipment types, manufactures, models etc, these must all be added, BEFORE you attempt to import. For Equipment Type I’ll be using AssetManagementEquipmentTypes.NetworkInfrastructure.Switch.Enum as the six items are all switches. For Manufacturer I’ll be using AssetManagementManufacturerAndModel.Cisco.Enum as the six items are made by Cisco. For Model I’ll be using AssetManagementManufacturerAndModel.Cisco.Switch.WSC355048PSS.Enum and AssetManagementManufacturerAndModel.Cisco.Switch.WSC356024PSS.Enum as the six items are a mixture. Maintenance Contract Reference Number and Maintenance Expiry Date are unique/random for the devices. Next the XML file needs creating to define the columns used and the classes/properties being referenced. 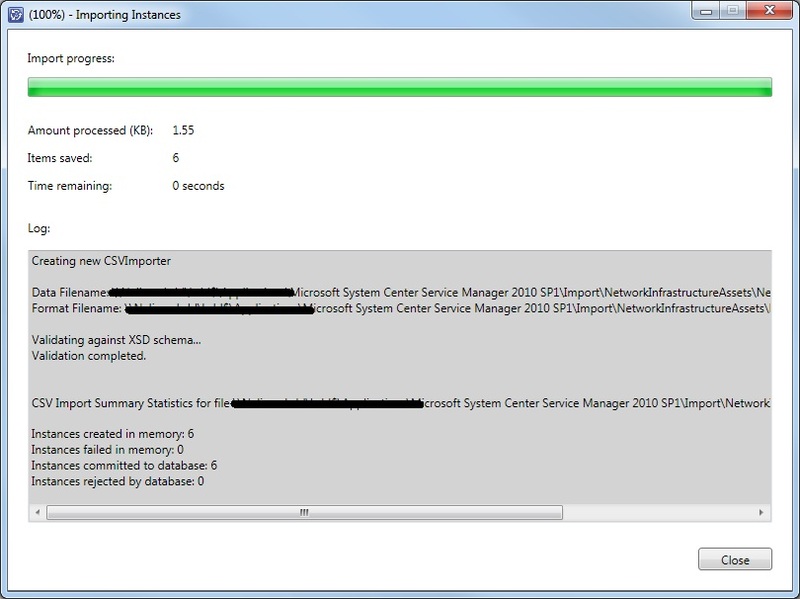 The Class Type defines the class within Service Manager to target the import at, in this example the “Network Infrastructure Asset” class. The Property ID’s then define what each of the columns in the CSV represent. 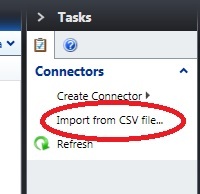 Finally to import the data, click the “Import from CSV file…” task from connectors, and use the browse buttons to select the XML file and Data (CSV) file. Hopefully, it should import them all just fine. As I’ve already said, this can be used for any class/property, both OOB and extended. You can also import things like asset custodians and other relationships by modifying the XML to include SEED properties, but I’ll save that for another post. I've uploaded the CSV and XML to my skydrive for you to download and play with. A list of classes and properties for the Asset Management solution can be found in the documentation included in the Asset Management zip file. Making real progress with your Asset Management MP. Really good product and is proving very useful. We're stuck importing mobile phones. Using this guide and the documents provided, we can add the phone and the number, but do not know how to link them together. We thought it was the IMEI number (FK1), but adding this to the CSV is not playing ball.